They don't call it a crumble for nothing. One of my daily reads is Eat, a charming and lively food blog written by Rebecca and her son Leland with occasional guest posts by Leland's partner Nathan. I love the blog and enjoy Leland and Nathan's posts but I particularly enjoy Rebecca's funny and forthright posts. When I learned that Rebecca would be in the area because her musician husband Bill was doing a show here, I jumped at the chance to meet her. The original plan was for me to meet Rebecca at the show on Saturday night but an earlier engagement in the evening ran longer than expected so we instead got together for breakfast the next day. Rebecca is just as lovely and lively and fun in person as she is on her blog, and her husband Bill, who I thought was a good sport to come along on a food blog get-together, is equally fun and enjoyable to spend time with. Incidentally, Rebecca and Leland are not the only members of the family to do a blog together; Bill and son Calvin author a PIttsburgh Pirate's blog. We had a pleasant breakfast together and then Rebecca and Bill got back on the road to head for Pittsburgh but before they left they gave me one of Bill's CDs. Yesterday, I put the CD in the CD player (how's this for an appropriate cooking song?) and set out to again attempt a crumble. Or a crisp. Or whatever it is that they're called. Now perhaps you're wondering why I was turning on my oven after all my carrying on about how I hated to turn the oven on in summer, and what's more, why I was using my oven on a day when the predicted high was 100 degrees. Good question. I was enthused about a recipe I'd found in The Best American Recipes 2004-2005 which the authors said was chosen by Food and Wine Magazine as one of their 25 best recipes of all time. Of all time! This had to be good, I thought. Worth turning on the oven for. So Sunday morning before breakfast with Rebecca and Bill, or before hearing a weather report saying that Monday's expected high was 100 degrees, I had gone to the farmer's market and purchased apricots, raspberries, and blueberries to make a crumble. 1. Adjust the rack to the lowest third and preheat the oven to 375 degrees. Place the apricots in a shallow 2 1/2 quart baking dish, such as a 10" deep dish pie plate. 2. In a food processor, grind the almonds with 1/4 cup of the brown sugar until fine, about 30 seconds. Add the lemon zest and process for about 5 to 10 seconds. Scrape the sugar mixture over the apricots and toss. Scatter the raspberries and blueberries over the apricots and drizzle with the lemon juice. 3. In the food processor, combine the flour, oats, cinnamon, salt, and remaining 3/4 cup brown sugar. Process for 10 seconds. Add the butter and pulse just until the mixture resembles coarse crumbs. Sprinkle the topping over the fruit and bake for about 55 minutes until the topping is browned and the filling is bubbling. 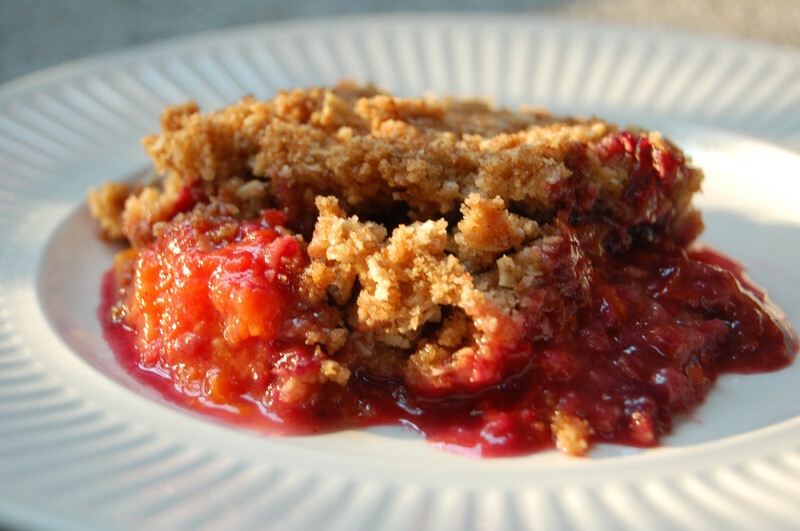 Let the crumble cool on a wire rack, and serve. I am happier with this crisp than my last one -- the filling was not as soupy and the top was crisper. However, I think when you read that something has made a food magazine's list of their 25 best recipes ever, your expectations become higher than they would be otherwise, perhaps unreasonably high. While the flavor was good, staying in the oven for almost an hour makes the fruit more or less disintegrate and I think I'd like something where the fruit retained a little more of it's original texture. Next time I'll try Rebecca's crisp topping which she swears by -- it uses melted butter and Rebecca says it makes the crisp crisper. Thanks for all the compliments! Isn't that "If Cook Like You Walk" song great? Next time listen to your mother and melt the butter; last week the Uber girls cooked dinner for us with our kitchen and all, and they made a peach/blueberry crisp with an oatmeal topping from an old recipe of their mother's, only they melted the butter at my suggestion and it came out beautifully crispy. Oh my. That looks really delicious. You know, Mizter S and I will be back in town on Friday. And we don't have plans.. The photograph is beautiful and it makes me want to bake a crisp myself. I had a blueberry crisp while on vacation, baked by an elderly friend, who refuses to give me the recipe! It's one of the best I've ever had--but she is determined that no one has that recipe. Honestly, people who don't share recipes give me a pain; she can't take her precious crisp with her!! Rebecca, that story about the Uber girl's mother is unbelievable. She sounds like she was a wonderful person. Sher, that's funny that she won't give it to you. Perhaps you could ask her to leave it to you in her will. Yum! I love anything with oatmeal. Now this looks yummy !!! I think you may have gone in with too high expectations. I think everyone in the world has said they had the best ( fill in the blank here) ever and really we were just lying. Maybe the food magazine people lied to you . You cook better than I do so can I come over ? that's quite a feat in our recent weather, thank god its over! there's so many funny names for these dishes... the best thing is, they're all yummy! I need to stop coming back to your page... every time I see that picture it makes me drool. My mom used to make something similar to this and she called it Lazy Cobbler. It was really good with ice cream on a hot summer day, especially when I wasn't the one cooking! Great song, by the way! I think something like this crisp, especially when it's supposedly one of the best recipes ever, would be worth turning the oven. Sometimes you just can't help yourself, and suddenly, the oven's on! Seriously, please start putting pictures up of carrots or green beans. I get hungry every time I read your blog and I really would like to wear something other than a tent at the beach this year! Christine, thanks for visiting and commenting. My German shepherds are both long-haired. They're hairy beasts but I'm fond of them. Rachel, I love oatmeal in baked goods too. Bets, I probably did go in with too high expectations. That happens to me with movies also which is why I never read reviews before I go. Ann, I am glad that the 100 degree temps have gone. It makes 85 and ultra-humid look good in comparison. aria, there's something about this time of year and berries, berries everywhere that makes you feel compelled to to something with them. Mrs. S., no drooling on the computer, it's too messy! Vanessa, crisps and crumbles and cobblers all pair so nicely with ice cream. FoK, it is hard to go completely cold-turkey on oven use. Angela, I'll see what I can do! BTW, enjoy your time on the Riviera. Who would have thought... I moved down to Daytona Beach only to buy apricots and find a really great recipe from my hometown of Baltimore. Thank you!! !